The opening track on the disc remains silent for almost 30 seconds before the piano sounds, with a pretty intro that immediately rolls into the second track, Bring Me Safely Down, a piano based pop ballad with heartfelt vocals and a lovely violin. Office Suite is spoken rather than sung and reminds me of 88 Lines About 44 Women by the Nails, one of my favorite 80's songs. It's a dead on, amusing rant about life in the office, with requisite mentions of Dilbert, carpal tunnel and tech geeks. The rhythm is catchy and simple, it's his wedding ring on a table top. Way cool, unexpectedly great track. 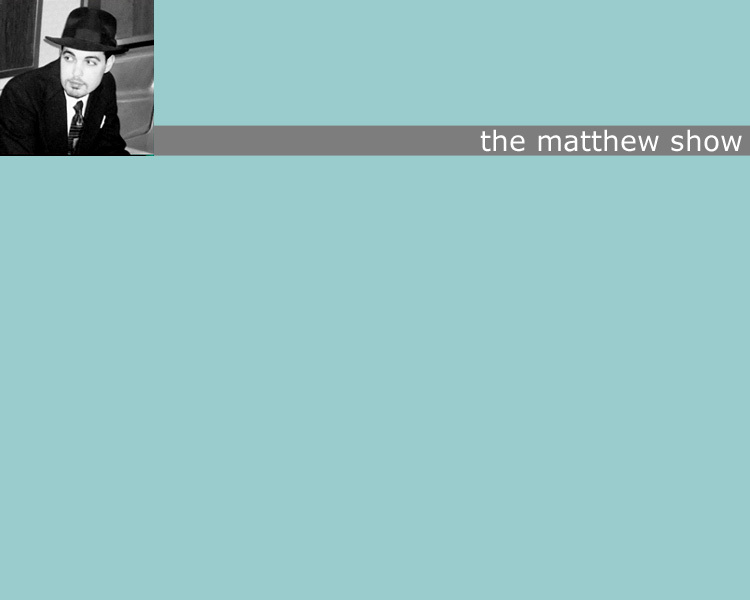 The Loneliest Boy in Toyland is another showcase for matthew's witty and acerbic lyrics. The bite isn't in the music which is melodic and warm with gentle rhythms that frame and highlight the bite of sometimes very amusing lyrics. matthew's voice is deep and calming. If you're not careful you'll be lulled into such a relaxed frame of mind that you'll miss the bite of his words. He recorded this album to make himself happy, and he should be overjoyed because it is a disc that should make the listener happy as well. I'd like to see him try some more musically driving songs to match his driving lyrics. The Texas influence is obvious and appealing, especially on Union Station. Now that matthew lives and writes in New York, I expect we'll see the change in his lifestyle mirrored in forthcoming releases.